Sinister and Tangerine star James Ransone is just the latest name confirmed for It: Chapter Two alongside Jessica Chastain as adult Beverly Marsh–formerly played by Sophia Lillis. 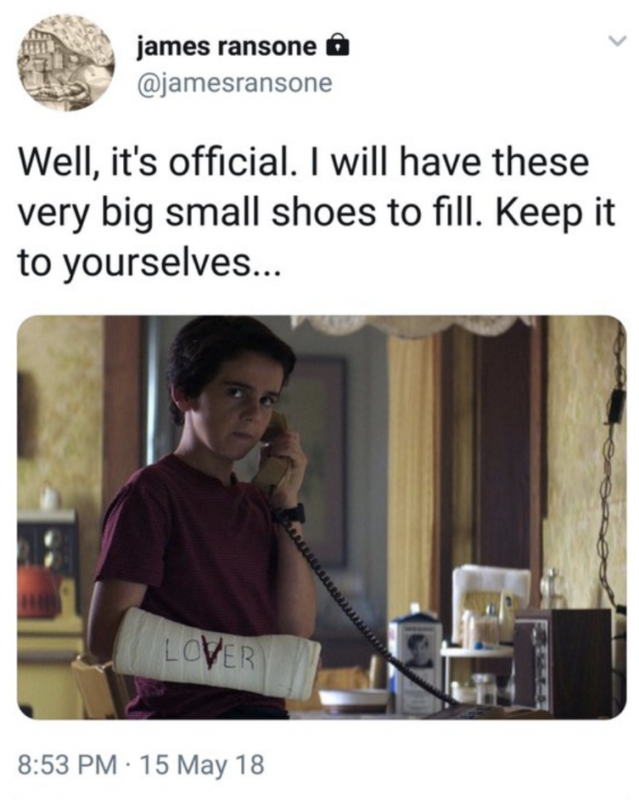 Ransone is set to play the adult version of Eddie Kaspbrak, previously played by Jack Dylan Grazer in the original 2017 film. Grazer’s performance was hailed by fans of the first film as he played “The Loser’s Club” resident hypochondriac brilliantly. Not only is Ransone incredibly talented, but the resemblance between the two actors is genuinely uncanny. Ransone announced his role in a since-deleted tweet on Tuesday. The internet, understandably, could not honor his humble request to keep the news quiet. Sorry, James. James McAvoy and Bill Hader are also in negotiations to join the cast. McAvoy would star as adult Bill Denbrough — the unofficial leader of the Losers Club — who was wonderfully played by Jaeden Lieberher in the first film. Hader would star as adult Richie Tozier. Finn Wolfhard (Stranger Things) portrayed the younger version of the role in Andy Muschietti’s first chapter. We can’t imagine a better fit for those roles – especially the always hilarious Bill Hader as the adult version of the young, foulmouthed Richie. Additionally, in a recent announcement from Variety, Andy Bean has been cast as the adult Stanley Uris. Bean is perhaps best known for his roles in Power, Divergent: Allegiant, and Here and Now. Again, it looks like the film’s casting director has a keen eye for finding talented adults who sincerely look like older versions of their child counterparts. Production for the concluding chapter is expected to begin later this summer, but we’re still waiting on casting information for fellow Losers Mike Hanlon and Ben Hanscom, as well as the villainous Henry Bowers. Warner Bros. is set to release It: Chapter Two on September 6th, 2019. Previous article‘Trick ‘r Treat’ is Back by Popular Demand at Halloween Horror Nights 2018!